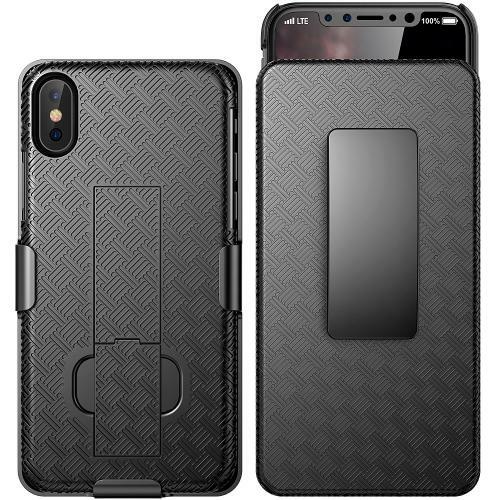 [REDshield] Apple iPhone X Holster Case, [Black] Supreme Protection Slim Matte Rubberized Hard Plastic Case Cover with Kickstand and Swivel Belt Clip @ AccessoryGeeks.com! This holster case is great for quick drawing your iPhone X for usage! 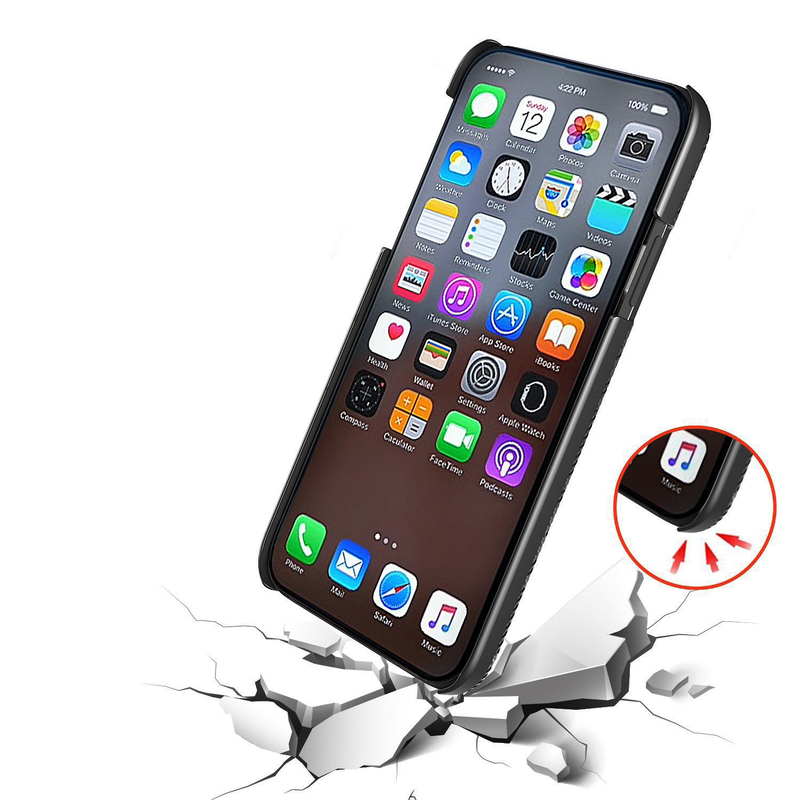 This quality product was made especially to fit your Apple iPhone X.
Apple iPhone X, if pictured, is for demonstration purposes only and is NOT included. 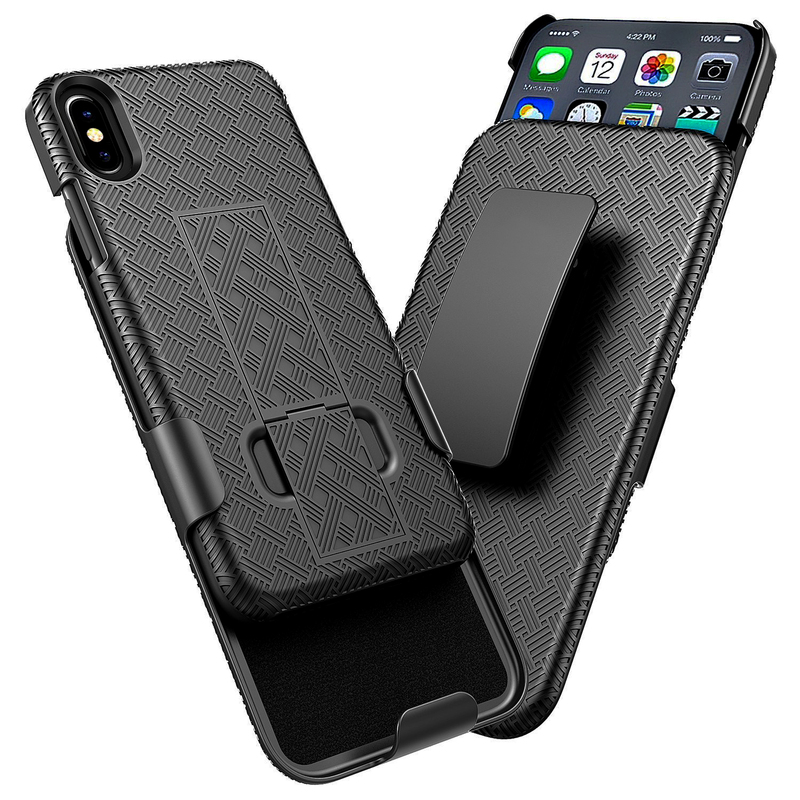 This holster case is great for quick drawing your iPhone X for usage! This quality product was made especially to fit your Apple iPhone X. It's stylish, simple and protective. 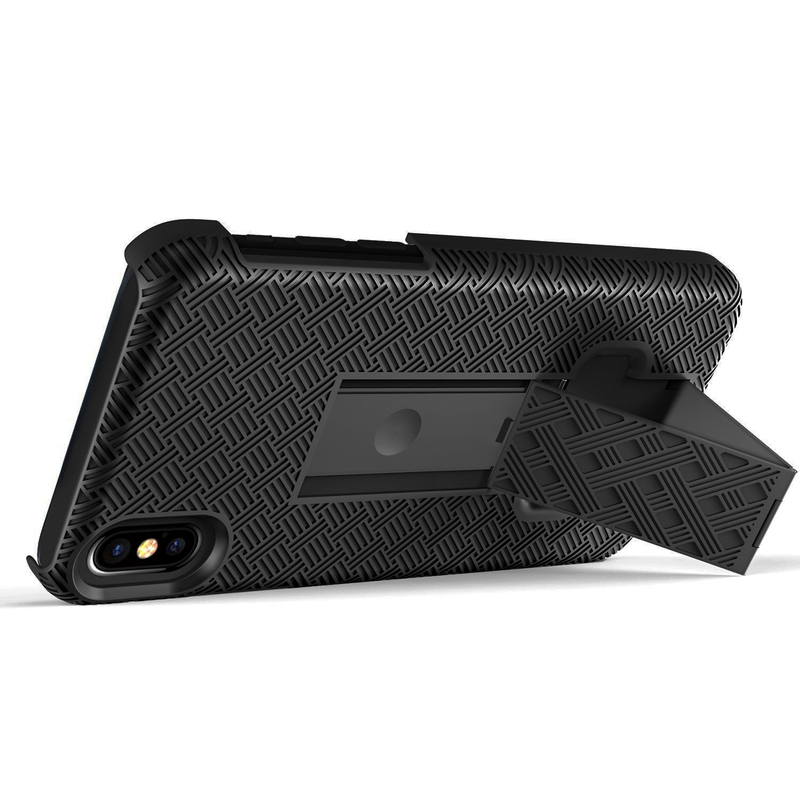 Quick draw your phone and slide out your phone from the holster that clips on to your belt or anywhere securely. Prop up your phone for great viewing position with the built-in belt-clip kickstand, or using the kickstand on the back of the case. Fits perfectly for my new iPhone X. I work in construction so I needed a way to keep my phone by my side while working not worrying to break my screen. Exactly what I needed. The kickstand is a nice bonus. 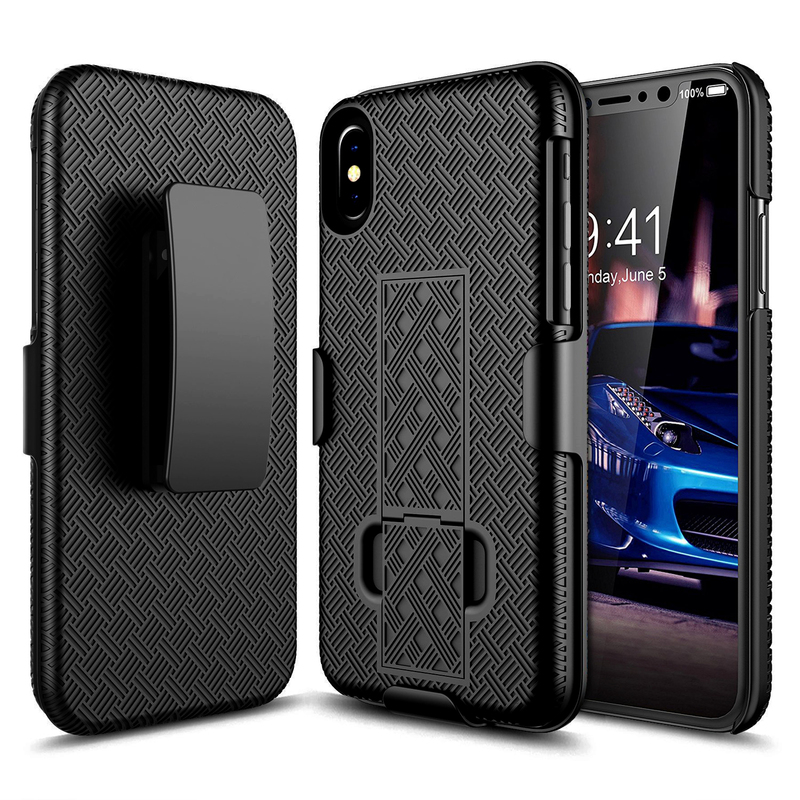 Quality made holster case and perfectly fit for my iPhone X. 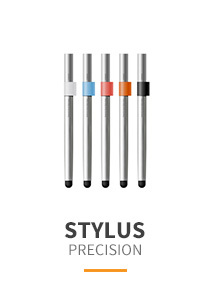 This is slim, durable with extra grip and give the ultimate protection needed. Love the kickstand for hands-free viewing! 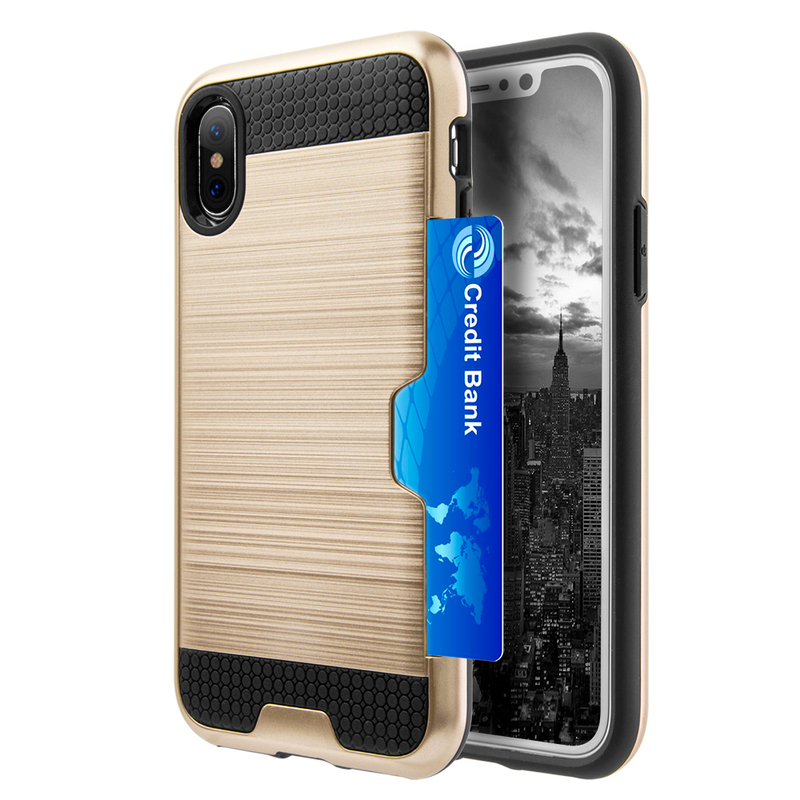 Great value for the money, I had one for my iPhone 6 fot the last three years and is still like new. Now, that I upgraded to an iPhone X I wanted the same value and protection! It seems that is well made and premium quality material. It keeps my phone so tight and secure. It has a great protection and kickstand was a great feature. I will definitely recommend it. 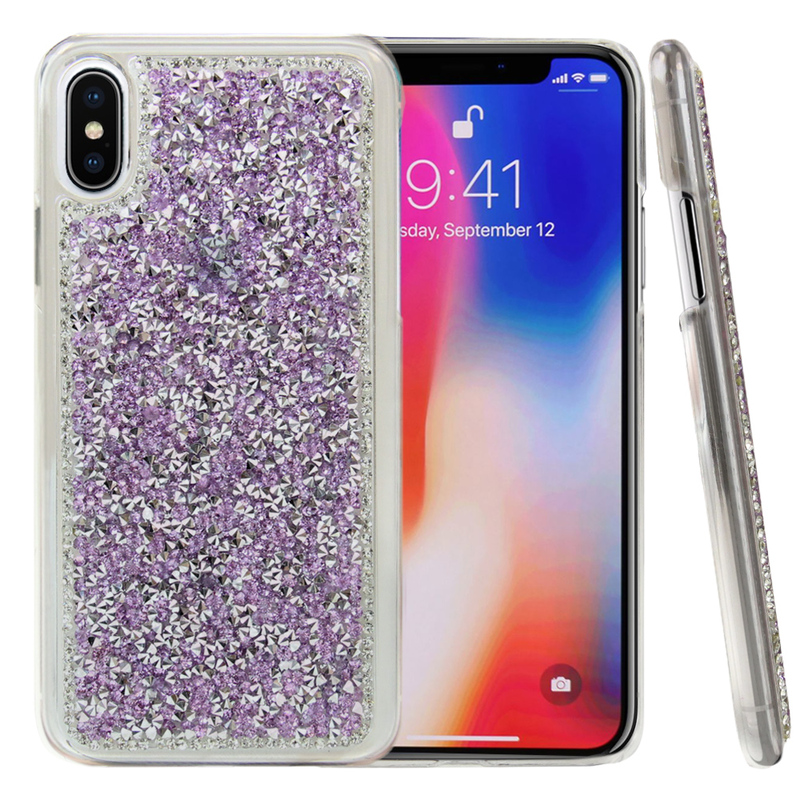 Such a great buy for my iPhone XS 2018! It fits perfectly and the holster allows the phone to change the angle. A great way to protect my phone. Well worth the money! I love my new holster case for my new iPhone X! 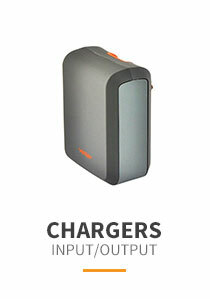 It's very practical, stylish, and made of a very hard plastic which is durable and it seems the sturdy case ever. Well worth the money! 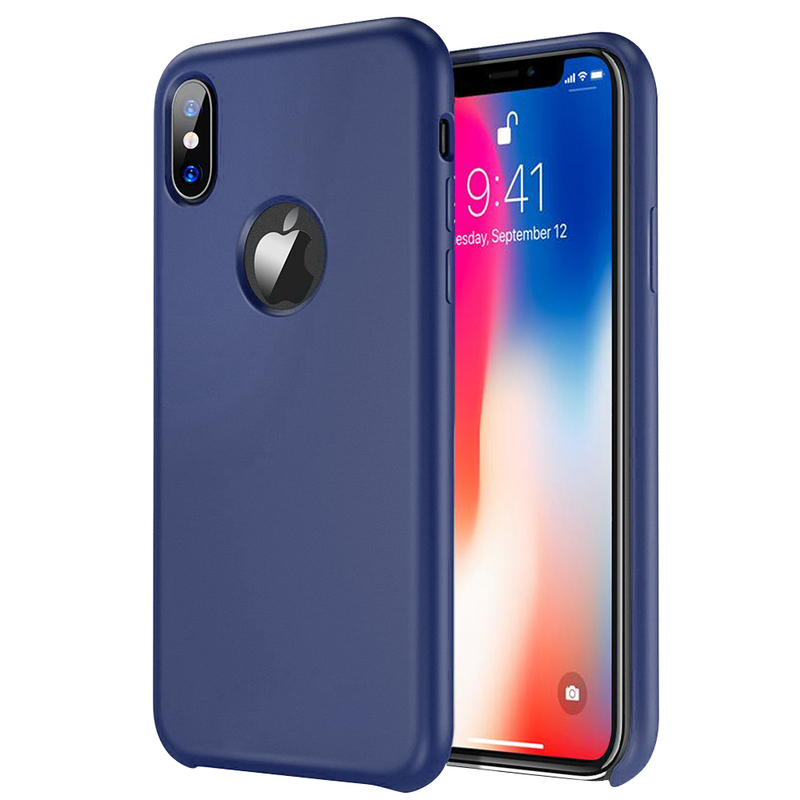 Best slim case for the price. It ads grip for dry hands and kickstand will perk the phone vertical or horizontal. It keeps my phone protected and it's always easy to get at on my hip. A great case! Solid, fits perfectly and makes it easy to hold the phone without it slipping. The kickstand is a great bonus. 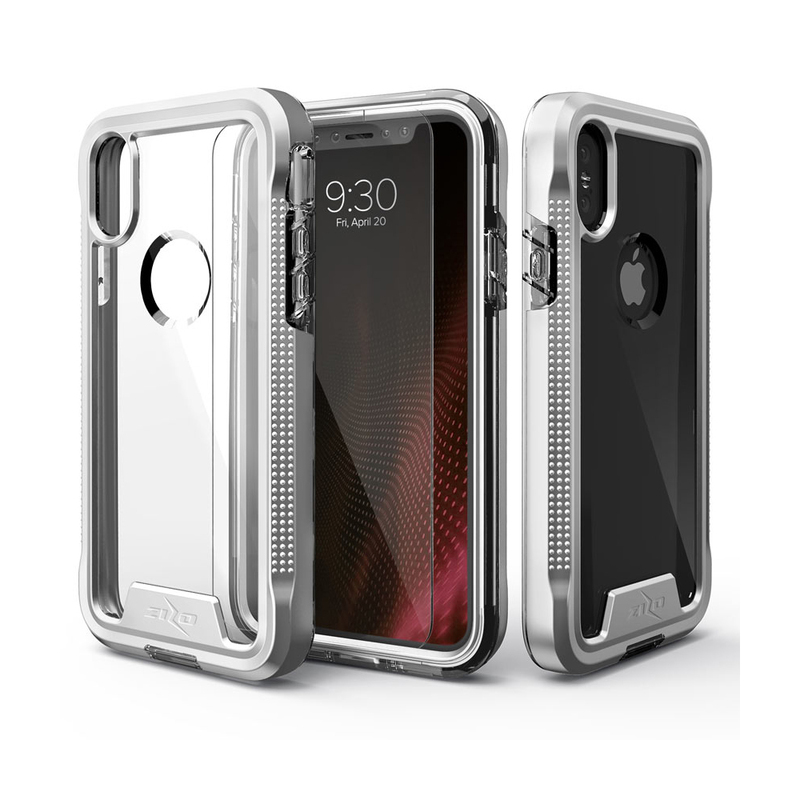 If you are looking for a good case with no downsides try this one. I love it! Great holster and case. Love the easel capability for propping phone up either horizontal or vertical! 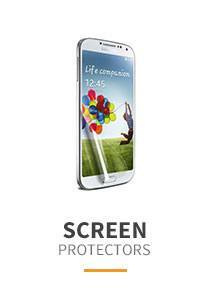 Provides great protection and the price was right! Works great! I have always been a holster guy. This case is held very securely by hip holster, kickstand on case is very nice touch that I've been using more often I expected. Satisfied with the purchase. Simple yet very durable Holster case for my expensive phone. I really like the feel of this case, easy to install and the kickstand was a big bonus for hands-free viewing. 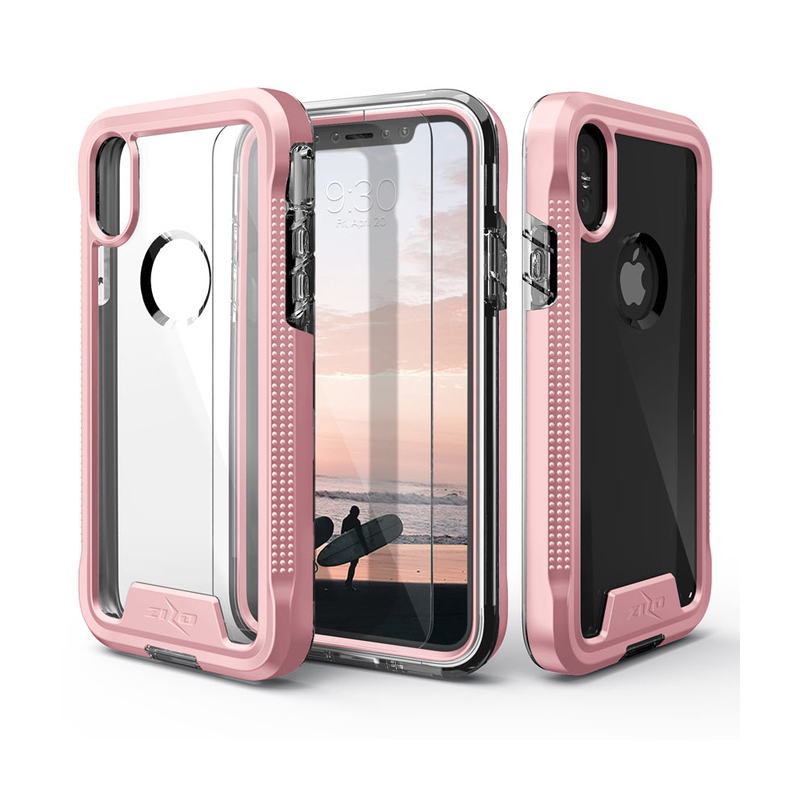 It holds my phone nicely and snug and I am able to slide the phone out of the case easily when wearing. The kickstand was great to watch a movie on my phone hands-free. Received today and immediately put it on my iPhone X. 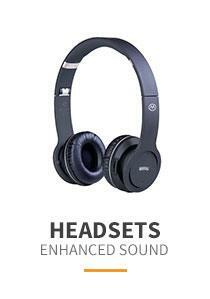 Fits perfectly, very stylish and seems it provides good protection. Excellent holster case! Just what my husband was looking for! Delivered as promised and this is inexpensive and versatile. He said, I've had their clips and kickstand are the best! Love the simple design! This is nice quality holster, slim matte with rubberized feel to prevent slipping from ones hand. 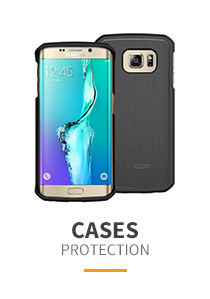 Safely slide the case with solid protection at a reasonable price. I have always used holster/belt cases, I love the clip for when I walk miles each morning. Also I have dropped my phone a few times with no damage. The kickstand was good on hands free viewing. Perfect! Fits great, durable and sturdy holster case. Exactly what I wanted and absolutely a great price. Keeps my phone protected and can props up the phone securely. Finally! 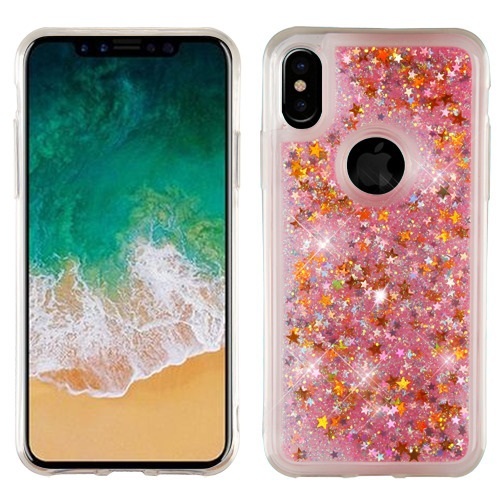 I found the perfect case for me! This is durable, lightweight yet very stylish. 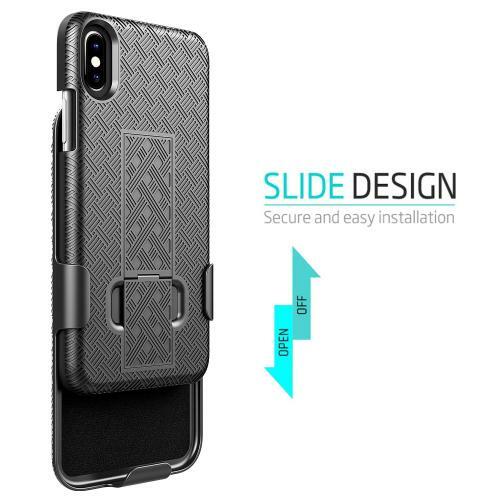 I can slides my phone securely into holster. I love the feel and well made design. Price was good. Amazing simple and pretty case! 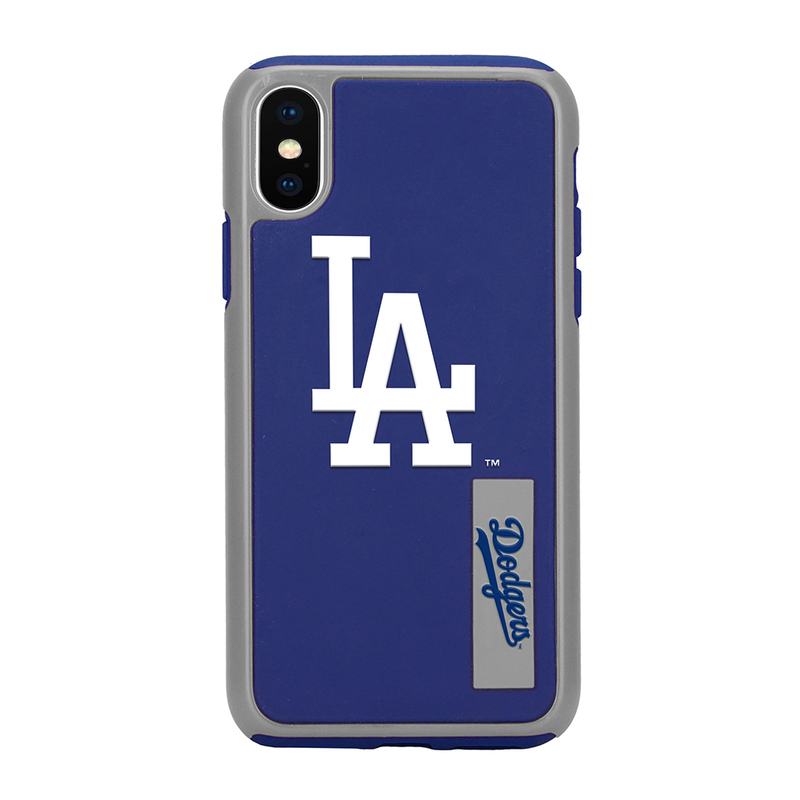 Fits perfectly on my iPhone X, durable and very stylish looks. Shipped fast and great price too! 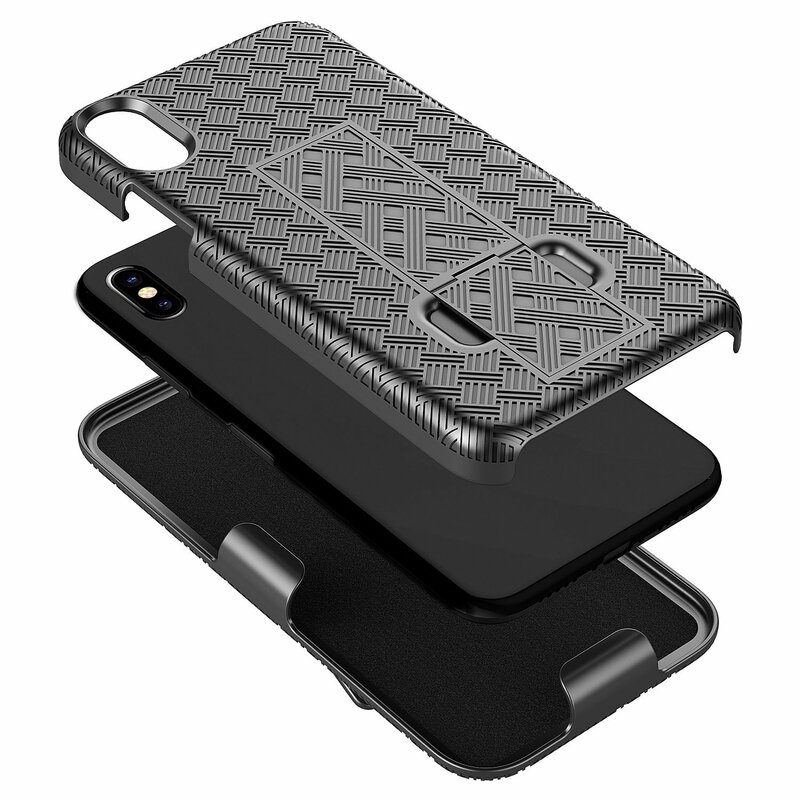 Fits great and durable it keeps my phone protected, safe and secured. 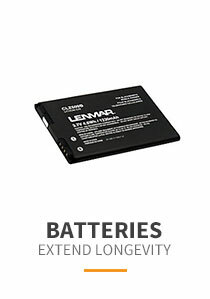 Great product for the great price! I bought this for my hubby and he likes it! Perfect for his lifestyle, simple but sophisticated and professional looks. With built in clip, kickstand and case slides securely into holster. Great case at fair price. It protects my phone and this is easy to remove phone when needed. Looks good and protect my phone very well. A perfect companion accessory for my iPhone X, a rugged construction yet has a soft textured feel to the touch. Built in stand for both vertical and horizontal hands free viewing. Also has a 360 degree pivot on the belt clip. Awesome!